I love organizing. Usually I take inventory of what I have and then organize around that quantity, always making room for my collection to grow. 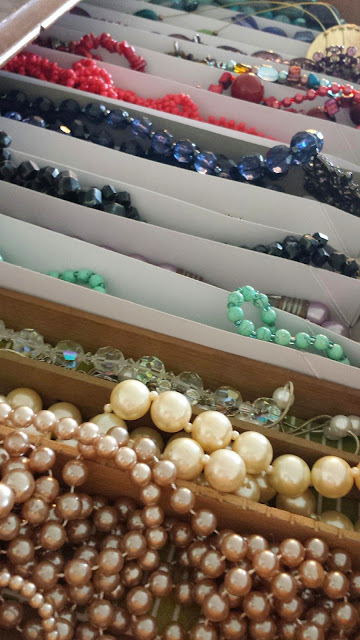 For my necklaces, I had pretty nails hung in my closet creating a beaded mosaic of color and texture. Downsizing these was a little daunting. It was easy to remove the necklaces I never wore and didn't like. But there were still several left. Too many. So I employed a tip that has been very helpful all over the house. Designate a small space and fill it with your favorites. This helped me to get of necklaces that might double another style or color. Also it helped me let go of one necklace that I like in theory but don't like wearing. And the necklace that I do like but needs some work and has needed it for 2 years? That one didn't make the cut. I have used this guideline to help me sort out everything from hair accessories to stationary. This is especially helpful for the collections that could easily keep growing. My heart is used to getting what it wants. I'm not good at denying myself. More pie? Yes, please. More fancy soap? Sure. More necklaces? Of course. Deny myself? No, thanks. I realize that when Jesus defined the job description of following Him, when it came to denying self, he wasn't literally talking about my necklaces. But He was talking about my heart. My heart for wanting more safety found in the things I have, more joy in the things of earth, more pride in who I have made me to be... He was saying I have to let go. I have to make Him my all.